Alison Caldwell : A new generation of innovators is developing breakthrough products and technologies without the huge capital costs traditionally required for cutting edge research and development. This agile approach leads to technology disruption, where inventions of new processes, products and systems are developed rapidly and applied to known problems in unexpected ways. 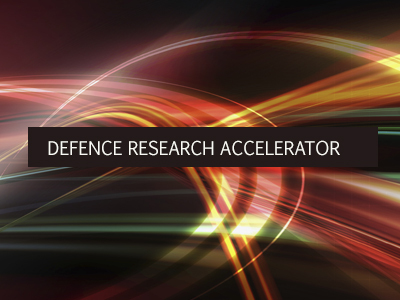 This Next Generation Defence Technologies podcast looks at the Defence Research Accelerator program, under the Next Generation Technologies Fund, focussing on supporting the start up community with an interest in Defence. The program works with existing accelerators within the national innovation system such as CSIRO's ON Prime program. I'm Alison Caldwell and I work for Defence Science and Technology or DST. I'm speaking with DST's Greg Denehy. Greg Denehy: I'm leading what's known as the Defence Research accelerator so as a program this is looking at how we can encourage and support the start up community and the bottom up innovation communities to look at the potential applications within the Defence environment. Alison Caldwell: How will it help start-up communities? Greg Denehy: Well I think traditionally it's been quite hard for a start up to consider how they might break into the Defence Department, Defence is traditionally long procurement cycles which aren't necessarily friendly with a start-up that may only have a few months to get their runs on the board to stand themselves up. We're currently finding ourselves in an environment where entrepreneurship, start-ups are becoming more acceptable more understood within the Australian environment and so we're looking at ways that we can help bridge the gap a little bit, how we can encourage people to think through how they might approach Defence as a pathway for their work. Alison Caldwell: Can you see start-ups contributing successfully to the world of Defence? Alison Caldwell: Because previously it's always been Thales, BAE, Lockheed Martin how can a small start-up get involved? Greg Denehy: So start ups have certain advantages over the big players they can be more agile they can look at things they can pivot quite quickly if need be based on the fact they don't have a large bureaucracy and process behind them that's keeping them on a certain momentum or a certain path. Start-ups being naturally small and agile mean that they can find what works and doesn't and they can change tack rather quickly. Many of the large players understand this, they are looking at how they might engage start-ups to leverage advantages they have within the larger context as well. Alison Caldwell: What sort of work are you doing outside of DST what's going on there? Greg Denehy: The primary purpose of the Defence Research Accelerator is to not be an accelerator program of its own. We're looking to predominantly partner with other programs and look at where we can add value and where we can leverage those. A great example of that is our partnership with the CSIRO ON program, this is run out of the CSIRO as a science and technology accelerator, looking at how they can draw research out of the universities and the publicly funded research agencies, how to accelerate getting their work out into the market place or even just finding the most appropriate path for it to take the next step. So we've partnered with the ON program to deliver a Defence specific stream within their pre accelerator program but we've also seen some great successes with the likes of Silentium Defence have gone through their ON Accelerate program as their full accelerator. Alison Caldwell: And we just happen to have Simon Palumbo from Silentium Defence sitting with us, Simon how did the ON program help you? Simon Palumbo: Yeah it's been going really good I guess the skills that we learnt, I mean the CSIRO ON program is all about empowering the researchers and giving them the skills to tackle the business world, I guess build those business models to then actually have a successful business. We've been going quite well it's still early days, but things are progressing , it's opened the door to a civilian market that we didn't really know about so that's been really beneficial and sort of opened our eyes to not only, we've come from a Defence background so it's opened our eyes to the civilian insight of things and the Defence market is quite a lengthy process I guess for procurement and acquisition processes so to have a civilian side of house which has shorter time frames is actually really beneficial for companies. Alison Caldwell: What was your idea? Simon Palumbo: We developed passive radar but it's not a new idea, it's been around for a while but we've got some really niche algorithms and the way we do it is quite unique. Alison Caldwell: What is passive radar? Simon Palumbo: Traditional radar works by sending out a large blast of radio energy and listening for very weak echoes what passive radar does is it uses existing energy in the environment like broadcast television, radio and that's its transmission source so then it can receive echoes from that and form the exact same radar picture I guess the advantages of that from a Defence stand point is you're not radiating anything you're not giving up your location so it's a means for covert surveillance and from a civilian standpoint you don't have a radiation hazard zone you don't need to worry about purchasing spectrum which is really pricey, so there's a lot of advantages on both sides. Alison Caldwell: Practically speaking how did the ON program really help? Simon Palumbo: I guess one of the big things was the mentorship so we had a really good mentor network it was really amazing like we had Greg, through Greg's involvement he actually brought in a Defence specific mentor and that was amazing it gave us insights into the value chain of Defence and actually who we should be directing our marketing and what not to, who we should be doing the market research with. The mentorship was amazing and we had the civilian side of house as well which gave us that business nous and understanding what we really need to be worrying about in the business side of things, you know your cashflow forecasting and so your modelling, down to the nuts and bolts of business models so you know how you should be testing that out, gave you that initial subset of ideas that you could test out to see if that's going to be a successful business model. Greg Denehy: What we are also looking at here is just simply to support research teams to find their path and that may be commercialisation, that may be to take a step out and create companies but that might also be just to find the most appropriate pathway to get funding to support their project and to take the next step. That was Greg Denehy, he leads DST's Defence Research Accelerator program. We also heard from Simon Palumbo, from Silentium Defence. Since its involvement in the ON Prime program, the company has gone from strength to strength, securing two major contracts worth $1.5 million through the Defence Innovation Hub. As well as the Defence applications, passive radar also has civilian applications including enhanced space surveillance and protecting critical infrastructure, such as airports, by detecting uninhabited aerial systems or drones for example. Applications for the next ON Prime: Defence program open in early February. It will run from May until August. I’m Alison Caldwell. We’ll have another Next Generation Defence Technologies podcast for you to listen to soon, so keep checking on @DefenceScience on Twitter, Apple iTunes, Stitcher, TuneIn and LinkedIn. Thanks for listening.